The longtime owner of the Dallas Cowboys, Jerry Jones likes to watch his beloved team relentlessly slaughter their enemies on the field from his prime seat, while receiving only the finest blowjobs. Gravely concerned about the future of the NFL, he's willing to put his millions of dollars of resources into anything that can expand football fandom. Just don't kneel during the National Anthem... or mention that his eyes are too far apart. Jones' appearance in "Moss Piglets" was in reference to reports that the notoriously conservative Jones has been trying to force out Commissioner Roger Goodell over the National Anthem dispute, claiming that forcing players to stand for the anthem would be the only solution to the declining attendance and viewership for football. The anthem controversy is not referenced directly because it was already covered and resolved in "Member Berries". 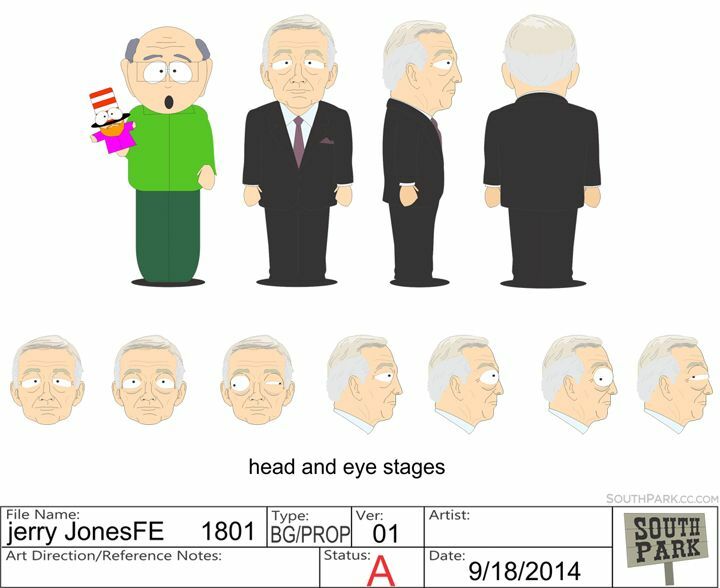 Check out this art used while creating the various "stages" of Jerry Jones' eyes for "Go Fund Yourself". In real life, Jones also once owned a Shakey's Pizza restaurant.